Max Darling hasn't been interested in crime since his brush with a seductive young woman put him in danger of losing his freedom. He even refuses to talk to a woman who calls for help and says she is afraid. The caller leaves word she's hidden something in the antebellum house Max and his wife, Annie, are restoring. When Annie finds out, she hurries to the woman's home, only to discover she's been murdered. Evidence links the dead woman to a fortune in gold coins that has recently gone missing. Was this mysterious woman killed for a fortune in coins? The dead woman's son is accused but Max believes in his innocence, and Max and Annie plunge wholeheartedly into the investigation. Are the coins hidden in Annie and Max's house? The intruder who shoots at Max seems to think so. And when Annie discovers the secret of their old house, death arrives at their door. Another good Death on Demand mystery. #18 in the series. 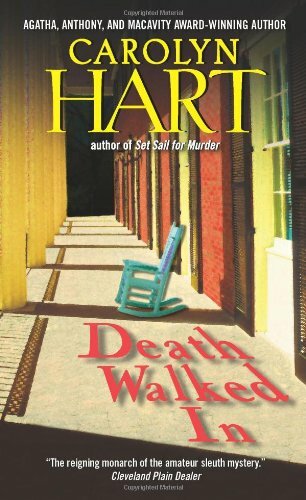 Another good mystery from Carolyn Hart. Lots of secrets in this one. One of the few times I have actually worked out part of a mystery, several parts, actually. It was a fun read, although I have problems with Broward's Rock as a locale. It is supposed to be a very small island, small enough for a person to drive from one end to the other in minutes and for everyone to know everyone else at least superficially and yet there are these societal levels much more like a large city than an isolated place like this. I'm happier when Max' mother and her friends are not around so this one was particularly good. I think I would have strong words with Agatha, perhaps more than words, too. Lots of fun. Just caught this one thanks!